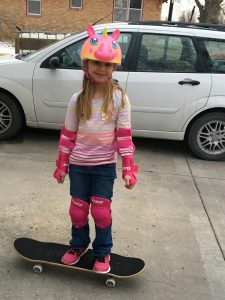 Post Rock Family Medicine » Helmets: Fit Your Lid! Thanks to Miss Shiloh Kuhn, our helmet model! Did you know that the majority of wheeled recreational vehicle (bikes, scooters and skateboard) injuries happen close to home? The standard use of safety helmets by children ages 4 to 15 would prevent up to 45,000 head injuries annually, according to the National Highway Traffic Safety Administration. Bike riding is a great way to have family time in the great outdoors and we want you to be safe while you have fun! EYES: Position the helmet on your head. Look up and you should see the bottom rim of the helmet. The rim should be one to two finger-widths above the eyebrows. EARS: Make sure the straps of the helmet form a “V” under your ears when buckled. The strap should be snug but comfortable. MOUTH: Open your mouth as wide as you can. Do you feel the helmet hug your head? If not, tighten those straps and make sure the buckle is flat against your skin. Wearing a helmet while riding a bicycle offers much needed protection in case of a crash or fall. The best way to ensure bicycle safety is to get the entire family involved. Set a good example for your children by following the rules of the road as well. Bicycle helmets help save lives! You can find more great information at Safe Kids Worldwide.